This is a companion piece to my essay on Fast Food Nation. In these politically divisive times, it is often difficult to get an accurate picture of what is happening. Exacerbating this is the plethora of propaganda, coming from both sides. Television has become increasingly conservative, and in response, film has become the outlet for liberal rage. The “documentaries” that have been recently released reflect this repressed anger. Not a bad thing in itself for film in general, but very badly handled in many cases, often manifesting in blatant sentimentality and cheap cinematic effects, catering to pure emotion and childish name-calling – definitely not what makes for good documentaries. In an eye-for-an-eye maneuver characteristic of such a polarized atmosphere, the conservatives lash back, this time in even baser terms and methods. This back and forth continues, each volley cruder than the next, until some of the attacks become obviously ridiculous, and it becomes uncertain whether we are viewing a silly argument or satire. In the resulting bombardment of shrillness, it thus becomes hard to ascertain what is truth, what is lies, what to believe, what to ignore. More importantly, all this noise makes it difficult to think. Of course, that’s what they all want – to tell you what to do instead of letting you make up your own mind. It is this run of forgettable insta-docs that had me recoiling, retreating back into the past in an attempt to escape the blaring, fear-mongering rhetoric from both sides. And that is when I suddenly recalled a short film that I had seen in my college days, What Farocki Taught. This simple little film, thirty minutes long, was far more effective in its message than any of the political documentaries today. What Farocki Taught was directed by Jill Godmilow in 1998. It is an exact replica of the film An Inextinguishable Fire, shot in 1969 by Harun Farocki at the height of the resistance to the Vietnam War. Everything in Godmilow’s film is the same as in Farocki’s – the script, the shots – except that the newer one is shot in color, English, and includes an introduction and end comments by Godmilow. The film is about the uses of labor and how the division of labor veils the true products of people’s work. It shows how ordinary workers doing their normal jobs at an American corporation can play a horrendous role in a war on the other side of the world. What makes this film so effective is that it avoids the cheap gimmicks present in many documentaries to make its point. It doesn’t scare you, it doesn’t make you feel pity, and it doesn’t manipulate your emotions. The film does not use music to heighten dramatic moments. In fact, there are no dramatic moments in this film. It is structured very much like a mathematical argument, logical and efficient, thus respecting that the audience is smart enough to make its own decisions based on it. The whole of the film can be broken down into seven parts, each part containing straightforward arguments shot in a bare, simple way. For example, in the first part, the narrator, sitting at a table in an empty room and reading off a sheet of paper, states that he intends to show the actions of napalm and the damage of it. He then states, very stoically and matter-of-factly, the reasons why he will not show napalm’s effects in the usual manner, explaining in a monotone voice that if he shows pictures of the effects of napalm, you will close your eyes first to the pictures, then to the memory of it, to the facts, and then to the connections between them. He refuses to show napalm burns because it will hurt your feelings and it will feel like the film threw napalm on you, alienating you to its message. He finally explains that they can only demonstrate what napalm can do, and he does this by burning his own arm with a cigarette, though not showing any pain in his face, voicing over at the same time that a cigarette burns at 400 degrees while napalm burns at 3,000 degrees. This whole sequence was done in one static shot, the camera facing the narrator, with no fancy editing nor fancy camerawork to distract. This opening statement reveals that Farocki understands the faults associated with most documentary footage of horrific events, that the graphic images only serve to push viewers away or turn them into mere spectators or voyeurs, gaping at sensational images and creating a distance between them and the image, instead of encouraging constructive analysis. Thus, instead of showing images of napalm victims, he states what the substance can do to a human being and attempts to show how such an inhumane weapon (which begs the question: what weapon that aims to destroy humanity is not inhumane?) is made in the first place, arguing that napalm must be stopped where it is made. This is done in the same logical manner. Here, Farocki recreates the Dow Chemical Corporation offices and shows the process from the beginning, when the CEO receives an order from the State Department for napalm. Again, the sets are simple, the shot setup simple, the editing kept to a minimum, and the acting is also done in the stoic, monotone manner of the narrative. All of this saps the film of its dramatic and emotional effect, leaving the bare bones facts to be considered. The CEO requests that the manager start research on the napalm. The manager says he doesn’t approve of the war, but will do anything to end it as quickly as possible (the “Glued-on Humanism”). 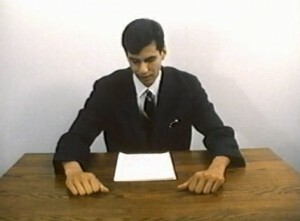 In order to be clear and make his point, Farocki has his character repeat the same lines over again, and even repeats shot setups in similar situations. The manager begins the process of making napalm, looking up its definition and listing its contents to the audience. Then he approaches each department in charge of each component. As he talks to the manager of each department, he mentions that “a chemical corporation is like a set of building blocks, you can put together the world with it,” followed by the department manager saying that he or she can provide that component. In each discussion with each manager, the shot setup and the lines read by the actors are exactly the same, emphasizing the point about the division of labor. What we get from this is that by parsing a task to its basic elements, not only are you able to complete it more efficiently, as theorized by Adam Smith, but a side effect of it is that the workers working on each individual piece do not see the bigger picture. Each component is not only used in napalm, but often in many everyday household items that help people. This makes for an excellent way of masking and feigning innocence in the development of a weapon such as napalm. The film shows various scientists and technicians appalled at the effects of napalm in the various news clips showing peasants being firebombed, but they are unable to make the connection that they are the cause, the ones that helped build the weapon. The division of labor creates a distance between them and the consequences of their actions. Because they are not able to see the connection, they feel no responsibility. Basically, if it’s not visible, then it doesn’t exist. Who’s to blame in all this? Is it the people up top, who have the big picture and who control the whole corporation? Or is it the workers who build each component, though they have no knowledge of what they are making? Throughout this essay, I have talked about this film as though it was Farocki’s, while it has been Jill Godmilow’s remake. The question arises as to why she would remake an exact replica of Farocki’s film, if the original suffices. The answer is simple. The film’s message is a strong one. It is eye-opening and, as all knowledge is, empowering. Godmilow mentions in her end comments that Farocki’s film was not shown in the U.S. originally. Her remake thus not only shows her admiration for the original, but also pays homage to its prescient insight by disseminating his point of view. She is helping to spread this knowledge around. In remaking the film, she makes it more accessible, not only because it will be released once more in the United States, but because it will also be in color and English. In the film, Jill constantly reminds the viewer that the film is a remake. There is the introduction and concluding question and answer session. Also, throughout the film at occasional moments, Jill superimposes the old film on top of the remake, showing the same scene. But it’s not just a tool to compare how similar the remake is to the original, but perhaps to point out how things have not changed. The film was released in 1969 to warn us of the possible uses of labor to create destruction. It was released once more in 1998 for the very same reasons. You can buy What Farocki Taught here.